First of all, today is the 44th Renaissance day for Oman, and everyone is looking forward to the bumper 10-day holiday that starts tonight! Now, since the news of the long holiday broke earlier this week, people have been trying to book vacations, and I'm sure quite a few of you (me included) have been shocked at just how much it's costing to get on a plane out of Oman at the moment. Even hotels in Dubai have cranked up their fees for next week. Supply and demand I guess! 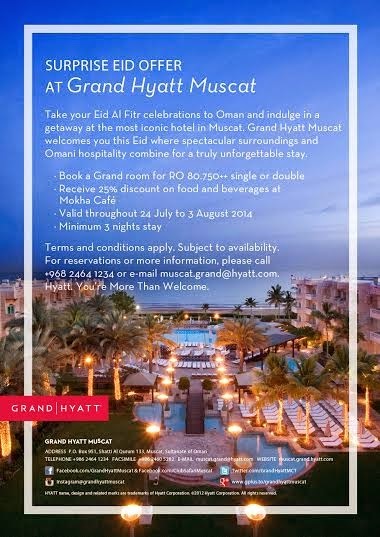 The Grand Hyatt are offering RO 80.750 ++ per night (when booking 3 nights in a row) along with 25% discount at the Mokha Cafe, valid anytime from tomorrow (24th July) till 3rd August. The Chedi are extending their Chill at the Chedi offer right through Eid (with a minimum 2 night stay) which also includes an Arabic Buffet for 2 per night. Topped off with 30% off at the spa and 20% on food and soft drinks. The cost is RO 85. If guests just want to visit and not stay, the Arabic buffet in The Restaurant is RO 21++ per person. RO 95++ per night room only, or RO 110++ including breakfast. They are continuing their summer offers right through until the end of September. RO 69++ including breakfast and wifi, valid from July 24th thru August 3rd. RO 55 plus 25% discount at their Souq restaurant, valid thru end of September. RO 59++ for a double room and breakfast. RO 50++ gets you a room and breakfast, wifi, and the pool and 20% off food and drink. More as I get em!